It is a warm day in early September. From the train station in Mendrisio, in the southern Swiss canton of Ticino, the mountain named Generoso (generous) rises above Lake Lugano and looks like a kneeling elephant. After walking parallel to the mountain base for a few kilometers, I turn right at Via Vignoo 3, into the tree covered driveway of the Brivio Winery, close to the Italian border. Guido Brivio greets me in the entrance hall at 9.30 am – exactly on time. Wearing a white jacket and trousers he leads me on an eight minute tour of the winery. Brivio’s winery is unique because of two reasons. The first is that punched into the walls of 16 ancient cellars are holes, each less than the diameter of a fist and four to six meters long. Each hole enters the porous rock substrate that forms Monte Generoso, and helps channel a flow of cool air into the cellars. Guido explains the benefit. The second reason the winery is unique is because it produces dry white Merlot. “The biggest challenge is to prove that we can make great wine in the Ticino, and for the international market too. Here, Ticino used to be Italy. We’ve always had a wine culture. 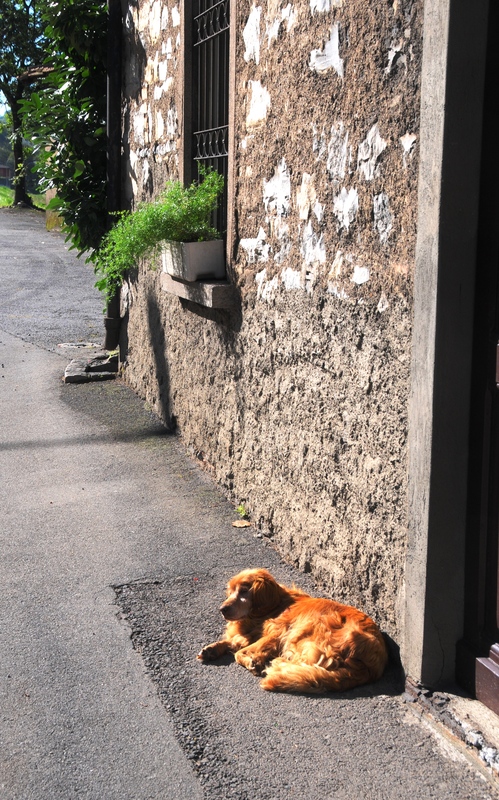 “In the late ‘80s there was kind of a revolution in Ticino wine. There was a new wave of winemakers that had new ideas. It gave a positive impulse to local wines. “For us, the goal was to create a new quality brand wine to go to top restaurants in Switzerland. After years the brand became well known in Switzerland. We did something good. The response of the market is positive. “Merlot is a great grape. You can make tons of different kinds of wine. Rose, white, dry white, blend it with Cabernet, make it red and fruity and light, or make a big heavy red for aging. It’s versatile. We used to have an importer in New York, but after 9/11 we lost him. My wife is American. I’d love to sell my wine in the States. But Switzerland is well known for cheese and banking and watches. Not so much for wine. “We have to become more solid. They have to recognize us abroad. You go to Bordeaux, the big chateaux, they know we make great Merlot. But they are professionals. The average consumer doesn’t know yet. “When I started, I received a lot of slammed doors in my face. Especially for white Merlot. I received a letter from a restaurant owner saying, “You are going to ruin red grapes to make wine. 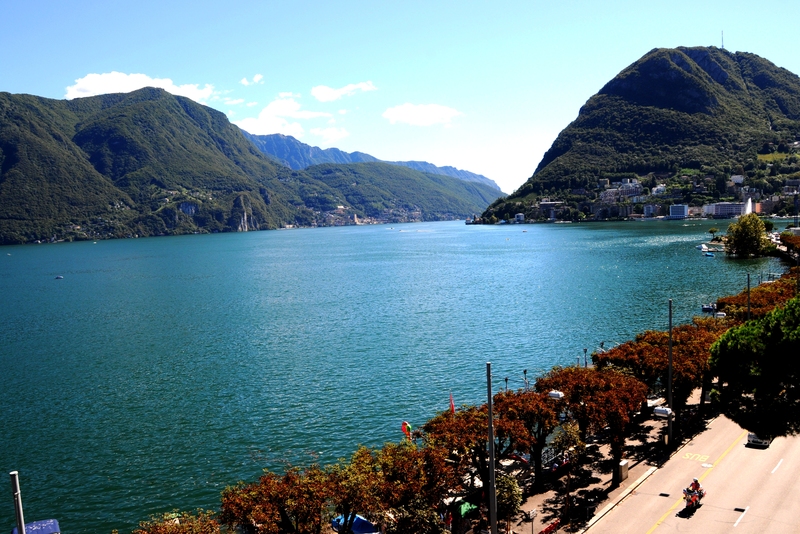 You’re going to ruin the image of Ticino. Please stop. It’s not going to be successful.” And now? He reserves maybe 60 bottles a year. Sometimes you have to go against the wave to try new things. “We use a lot of oak, all from the Massif Central of France. For red wine we go for medium toasting. For white we use a heavier toasting. The most important is the grain of the wood. Big grain gives less oxygen. The important thing is oxygen going through the oak and breathing with the wood and wine. “It’s a 360 degree job. You’re in contact with nature in the vineyards. You’re exposed to the technical part of the winemaking process. The most fun is promotion – you meet tons of people. Basically wine is emotion, so you have to communicate your emotions to everyone else. We’re lucky to have this job. 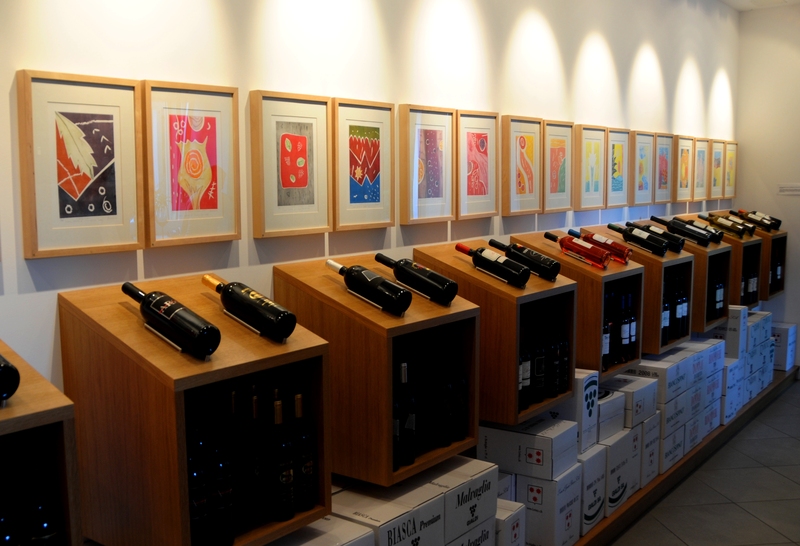 We enter the tasting room, where bottles stand before paintings. Each image represents the taste of a particular wine to the artist. We finally taste Guido’s prize– white Merlot. The word precise also sums up Guido’s business strategy – methodical and focused. A half hour later, on a lazy morning in the Ticino, I walk back to Mendrisio to catch the train to Lugano. Beside clocks and well engineered highways and tunnels, the truth is clear: the Swiss reputation for innovation and detail now touches their wine. Fascinating! Did not know untill the 3rd June when for the lunch, guest accompanying us suggested and we had it and fell in love with it. Superb wine. Love the article – tasted the white merlot via a friend from England! It was delicious – chi ching! 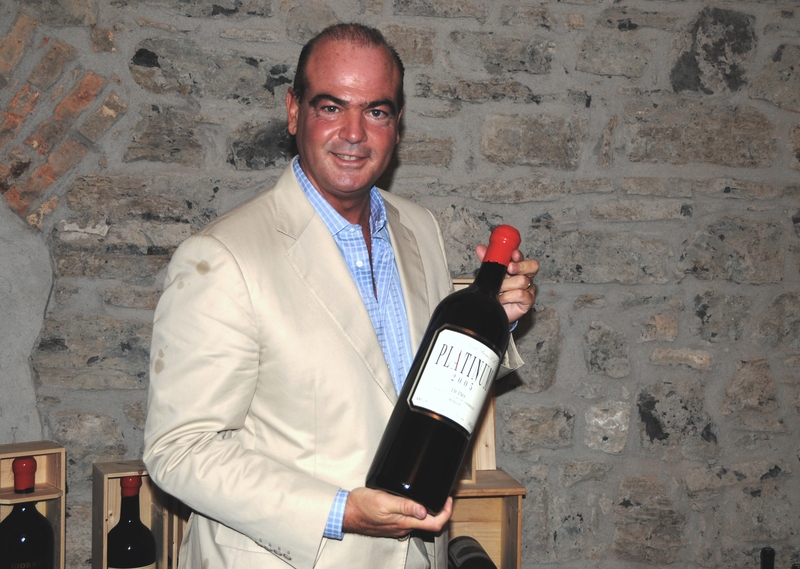 Wonderful article on Guido Brivio and his wines from Ticino. We love his wines and wish we could get them in the states! Ticino and it’s wines is one of the secret treasures of this world that many do not know about. Thank you for informing more people about Brivio’s exceptional White merlot and this incredible wine region. 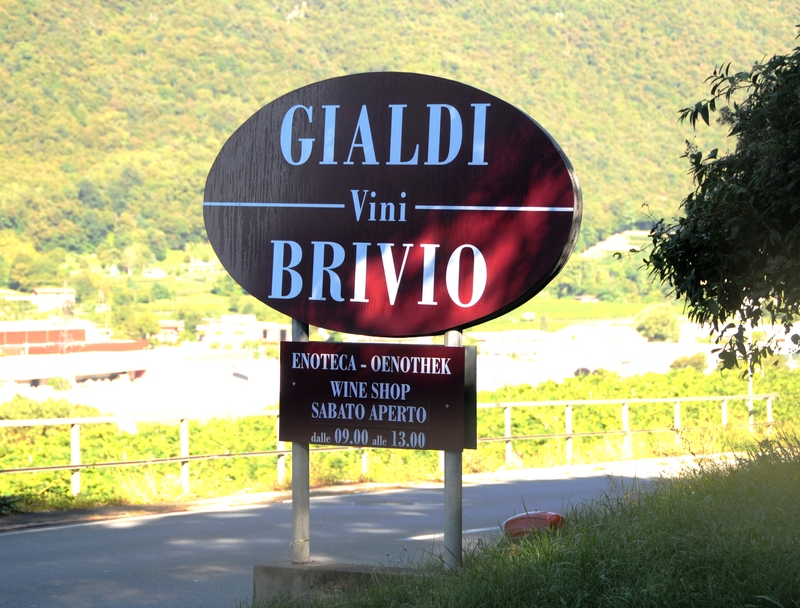 Is there anywhere in the United States that imports Gialdi Vini Brivio wines?